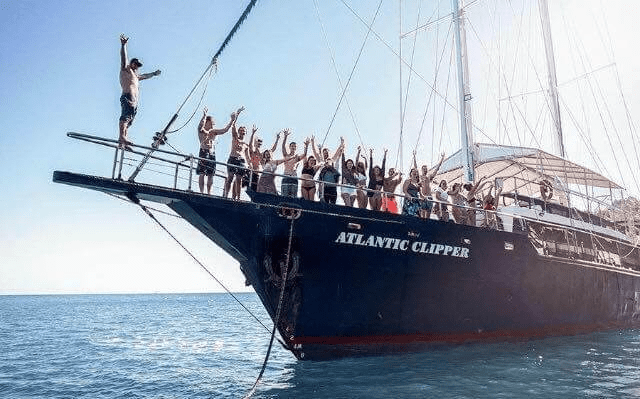 Full list of Whitsundays boat trip backpackers will love, the absolute lowest prices available for your selected dates with maximum fun on offer. All equipment and refreshments are provided in the low price, no added charges. You must see this if you are looking for the cheapest option to tour the Whitsundays by boat. We have a price guide list below to discover if the package is within your budget, to get a price for your dates hit the “Book Now” text and use our live available booking system to get your place secured. If you need to know any more details about any of the Whitsundays tours please go to our homepage or take a look around the rest of our site. We have packages available for half days, full days and even overnight trips. Look below to start your adventure. All the leaving days and times are listed below together with an estimated price per person for each trip, the price may go up or down slightly for your selected dates. Hit the “Book Now” text to check a place is available for your selected travel dates. All tours are just perfect for backpackers and students, these are the lowest possible prices you will find anywhere. For details of what backpackers on a boat trip should take with them follow the link. If you have any further questions about any of the Whitsundays boat trip backpackers options please get us right now on live chat or send an email today. We will get back to you asap.